United States. I have traveled many places, but Catalina Island was different. My husband and I had just been married a little over a year when I drove to work and found a limo waiting for me. It took me to the airport where I met my husband, and he still wouldn't tell me where we were going, even after we started to board the plane. Once we got to Catalina Island we checked into our hotel in Avalon. We stayed in Hotel Vista Del Mar. Even if we had never left the hotel, this would have been the most romantic vacation I have ever had. We did leave hotel though, many times during the 4 days we were there. My husband had so many exciting things planned for us. He apparently knew of a nice secluded little cove where we walked along the beach to and had a few glasses of Merlot. That was my favorite part of the vacation. If you were to ask my husband, he would tell you that the best part was when we went on our kayak tour.The kayak had a glass bottom, and the spot we toured was filled with tons of fish and other sea creatures as well. 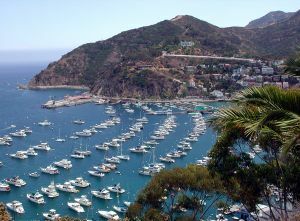 The trip to Catalina Island is definitely one you should take for a romantic vacation. Join in and write your own page! It's easy to do. How? Simply click here to return to California Vacation.